Vedos Chat is a user-friendly application for real-time Audio Video chatting in office or home office local networks. Digital Effects was developed to be a plug-in for MSN Messenger video chatting, produces special effects for video communication. Digital Effects was developed to be a plug-in for MSN Messenger Video Chatting, produces special effects for Video communication. While the plug-in loads user can blur the background of photos to help protect privacy. Users can select 3-D costumes or other digital effects in a pop-up window, and those effects will be applied to a selected photograph. Using Free webcam effects software is the best way to customize yourself during video chatting with your friends in your instant messenger (Yahoo messenger, Windows Live Messenger, Skype, AOL Instant Messenger, ICQ, etc. Record and play back you day like a movie. BuddyLive from WebCamDV allows you to use your DV camcorder as a Web cam in conjunction with any Instant Messenger application (AOL IM, Yahoo Messenger, MSN Messenger), letting you videoconference with or send still images to your AIM buddies. 2YourFace is a funny add-on for your browser. 2YourFace is a funny add-on for your browser. It provides audio and Video streaming capabilities to your Facebook Chat. 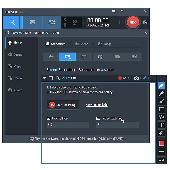 VideoSkin.Net v1.3 program is a unique application that allows the user to add a Flash® animated background that will enhance a webcam experience. Through a simple process, Flash® animations can be applied to be a foreground or background. VideoSkin.Net splits an image into three layers and applies a flash animation or image to a single or multiple layers.